Gaming peripheral specialist Tesoro has launched a new mechanical keyboard which it claims will “make some noise in the industry”. The Tesoro GRAM Spectrum is the name of the keyboard and, as hinted at by the name, it is a slim, minimal device with full RGB lighting. Tesoro leverages its new low-profile AGILE mechanical switches to slim down this peripheral, while providing the tactile feedback users love combined with a short key travel distance which is growing in popularity with gamers. 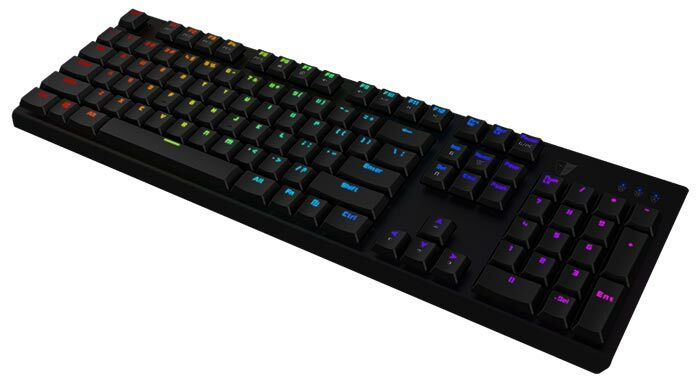 The Tesoro GRAM Spectrum is designed with a minimal and slim aesthetic yet offers all the functionality most users require from a gaming keyboard. This metal base constructed keyboard is equipped with double-injection keycaps, offers full macro and key assignment programmability, provides 16.8 million colour customisable lighting (with 9x lighting effect presets), and features an ARM Cortex processor backed with 512KB of memory. Looking more closely at the Tesoro AGILE mechanical keyswitches at the heart of this design, Tesoro says they are ‘gaming grade switches’ and claims they are ‘the fastest tactile-feel switches in the world’, rated for 60 million keystrokes. We are told that the keys are low-profile, and they look about half the height of a standard keycap. Tesoro says that the keys offer a 3.5mm travel distance but have neglected to detail the actuation distance and force required – which are erm… key considerations. Both ‘Red’ and ‘Blue’ style AGILE switches are available which I would think would provide quiet or clicky actuation, respectively. Other important features of the Tesoro GRAM Spectrum include; a 1000Hz polling rate, full N-key / 6-key rollover, 6 multimedia keys, and a 1.8m detachable braided cable. Special key functions include; Keyboard lock, Reset Hotkey, Instant Macro Recording, and Instant Profile Switch. This gaming keyboard measures 445x136x24.5mm and weighs 1.05Kg. In an email to HEXUS Tesoro said that the GRAM Spectrum will be available at the beginning of June and be priced at $137.00 (Black) and $139 (White). Looks good, pricing might be a bit steep though. How do Tesoro's switches compare to Cherrys? OK I am a bit late but this looks amazing, if they have a 10keyless design it would be an instant buy.